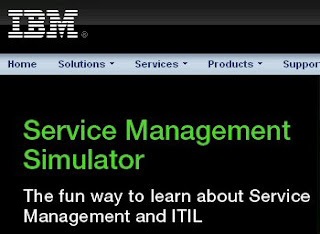 IBM's Service Management Simulator is a Tivoli campaign, as is made clear by the URL. What is less obvious is how IBM hopes to lure new business to its legacy network management package by teaching web visitors about service management and what is in North America a lesser-known set of service practice standards-- ITIL. Through the virtual simulation experience, you will gain a better understanding of the challenges facing different people in a company from the CEO to technical support, the value of processes and tools, and how various parts of the company positively and negatively impacted the hypothetical company’s performance.